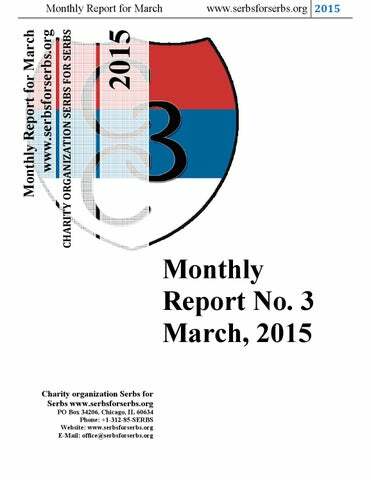 Monthly Report for March Dear friends and donors, Charity organization Serbs for Serbs registered in the state of Illinois in United States in Jun 2010 by the group of the Serbian youth. Charity organization Serbs for Serbs is a 501(c)(3) notfor-profit charitable organization. Donation is tax-deductible to the extent followed by the law. On 30th September, 2011 we finally got the letter from department of the treasury (IRS) with tax exempt 501(c)3 approval. All donations to our organization donated from June 16, 2010 are tax deductible under section 170 of the Code. We are also qualified to receive tax deductible bequests, devises, transfers of gifts under section 2055, 2106 or 2522 of the Code. Rastko and Ognjen on their new beds Having previously visited and met the Nikolic family, members of the Charity organization SERBS FOR SERBS successfully carried out another action in the territory of the city of Prijedor. The Nikolic family was provided with two double deck beds with mattresses. To remind you, the Nikolic family is a six-member family, consisting of the parents, Danko and Snezana, and their four children, Ognjen (12), Andrea (6), Marina (3) and Rastko (1). The total value of the aid delivered was 1,187.60 BAM. In the end, we wish to convey greetings and gratitude to all donors of our organization from the Nikolic family. We also wish to invite all donors and friends of the organization to support the work of the Charity organization Serbs for Serbs in the way they can. www.serbsforserbs.org 2015 Not long ago, their home was filled with joy again, because they were visited by the representatives of the Charity organization Serbs for Serbs, in charge of the southeast Serbia, with the local activist and laboratory technician, Novica Cvetkovic, and they donated them a wood-burning stove. “We’re thrilled because we’ve managed to repair our house in such a short time and generate some income so our children wouldn’t starve any more. I wish to thank all good people from abroad, our immigrants, who have given us new life and created prerequisites for a fresh start by making contributions. When we were first visited by the Vesti reporters, we only had one room. I gave birth to twins, who slept on a mattress, we struggled daily to provide milk for them, and we borrowed linen so I could make diapers for them. The Stojiljkovic family with five children, from the hamlet of Berivojstica in the Golemo village, about thirty kilometers from Vranje, had been a wretched, poor and unfortunate family, before they received donations from benefactors from the diaspora, noble readers of the “Vesti” and the Charity organization Serbs for Serbs. Today they have become independent and happy, having used all aid received to make a better future for their children – they have found their feet by starting a business in goat-breeding, and finally they have repaired their unfinished home. There could probably be no better news for us in the “Humanitarian bridge” section of the “Vesti”, or for numerous people who had also been sending them a piece of themselves through their selfless contributions for months. In only six months, the head of the family, Slobodan (37), and his young wife, Sanja (28), managed to provide a more certain future for their five children: Luka (9), Lazar (8), Marija (5) and seven-month-old twins Petar and Pavle. We lived on welfare and child benefit, which is the sum of 16,000RSD, or 140 Euros per month. Our main source of income was mushroom picking and when the year was good, we could afford to buy flour and other basic necessities. Today, having a flock of sheep, bought for us by good people from abroad, we have started to live off our work and our own hands. It was the goats, not the money that was at a forefront of our mind, so we could start making an income and live like all other people. Why expect charity when we are all healthy, thank God, and we can go forward on our own. All we needed was a little boost, and we got it from humane people,” says cheerful Sanja. Thanks to benefactors from the diasporas, the Stojiljkovic family now has a flock, consisting of nine nannies and a ram. Young mother, Sanja, tells us of the time Petar and Pavle were born. “I gave birth in hospital in Nis, on July 9, 2014. The birth wasn’t easy, that’s why I was transferred to Nis. We hadn’t planned on having twins, but it was God’s will. What’s important is that they are alive and well, and since they were born on the day before St Petar’s Day, we decided to name them Petar and Pavle. Back then, the five of us didn’t have enough money for food, let alone other things. Now the old rule reapplies that children are never an excess, but they are the biggest joy in life and the crown of our love,” says the housewife Sanja. They provided food for them for the entire winter and started producing cheese. “Today we have several types: fresh cheese, ricotta cheese and cheese preserved in oil. We have conditions to store them in utility rooms in my home village of Tumba, at the foot of the Kukavica Mountain and that’s where the cheese production starts. We invite all people of good will, if they ever find themselves in this craggy area, to come and taste our cheese which is also theirs as well,” emphasizes the host, Slobodan. Thanks to the CO Serbs for Serbs, who read about their unfortunate situation on the “Vesti” portal, the family was helped in a concrete way: the necessary interior works were done and the rooms where they could live were furnished, and they were provided with kitchen appliances. In this way, they got one more room, hall, bathroom, washing machine, cupboards, wardrobe, and now a wood-burning stove. www.serbsforserbs.org 2015 The father, Goran, is a former football player, and now, having graduated from the Faculty of Theology, he works as a Religion teacher. His wife, Tanja, is unemployed. In her free time, Tanja makes very interesting icons on Biber plain clay tiles, which she sells in order to increase the budget of this modest, but hardworking family. In mid-May, members of the Charity organization SERBS FOR SERBS visited the nine-member Krsmanovic family from Zabrezje in Obrenovac. Goran and Tanja have seven children: Teodora (13), Stefan (10), Djordje (8), Jovan (5), Filip (3), Andrej (2) and Anastasija (1), and soon they are to take a foster child into their home. Arable land near their home, where the greenhouse is planned to be set up The Krsmanovic family owns 1ha of land, which they lease, but they also have a piece of land which is close to their home and this is where they expressed a wish to make a greenhouse. They would use the greenhouse to grow healthy food for their children but they could also sell fruit or vegetables to improve their financial situation. WHIT FAIT IN GOD! We invite all people of good will to continue supporting the work of the Charity organization SERBS FOR SERBS and thus help and give joy to numerous children in need. 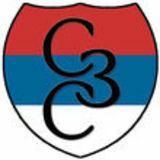 For years, Serbs have had a global charity organization. By choosing the name, its founders have, actually, written the shortest program. It consists of only three words, Serbs for Serbs. In terms of organization, young people form the backbone of the organization Serbs for Serbs. The majority of them live in diasporas – in the west European countries and overseas. In their work they use modern means of communication, primarily the Internet. At the official website, they have to account for each and every collected and invested Serbian dinar, Euro, US dollar, Swiss franc, Convertible mark. www.serbsforserbs.org 2015 Diaspora: First among equals who have built and affirmed the Charity organization Serbs for Serbs, is the President Igor Rasula. At the beginning of the interview, we ask Igor what he considers to be the most valuable result of the work of this organization. Igor Rasula: The most valuable result of the hard work of the Charity organization Serbs for Serbs is the fact that, in the past ten years of dedicated charity work, we’ve helped more than 1 400 Serbian families with many children which together count up to several tens of thousands of children. The organization was launched with the aim of helping only one family, and with God’s help the number of those whom we help is increasing almost every day. Thanks to numerous donors throughout the world, today, dozens of families live in their warm homes, children sleep in their own beds, the food is prepared on an electric or a wood stove, they have their own bathroom, refrigerator, washing machine, they have water and electricity supply in the house, the roof does not leak, perhaps for the first time they even got their own bedroom, a desk, a wardrobe, a toy, a computer... Many parents, today, are able to provide their children a glass of fresh cow or goat milk, they have a tractor to work on the field and earn for themselves. Many families received fresh hope and faith to fight for themselves and their offspring, and to stay where they are, on their fatherland. Here is several data as an illustration. On the bank accounts of the organization, up to March 6, 2015, there was 6 010 433 RSD, 86 031 BAM, 34 821 CHF, €19 183, $36 901. Since 2006, €1,137,166 has been raised. So far, this year, €35 970 has been raised, and the goal that they have set for themselves is to raise 250 000 € (the data is taken from the official website of the Charity organization Serbs for Serbs). Monthly Report for March Igor Rasula: The truth is that in the past ten years of hard and persistent work, we have gained the trust of the Serbian people in the homeland, the region, but especially in the Diaspora through hundreds of implemented actions to help disadvantaged families. This trust and support that we have is not something that is everlasting, but it is put to the test and examined almost every day, both by the old and the new donors. It is very important that people are able to check on where, when and how the collected donations are being spent, because in humanitarian work and activities there should not be any secrets nor hidden information. All the actions that we undertake to help the families, and the collection and expenditure of funds are transparent and always open to control and verification, primarily through our official website www.srbizasrbe.org and our popular Facebook page www.facebook.com/srbizasrbe. There are also monthly reports which we are required to send to all donors. Diaspora: Following your work, we know that you have had problems to set up a part of the organization in Belgrade. Whatâ&#x20AC;&#x2122;s the situation today, have you encountered any understanding from the authorities in the Homeland and homeland countries? Igor Rasula: Unfortunately, the relationship with the authorities in the Homeland and the region has not changed much, either positively or negatively. On our part we are trying to make contact and establish cooperation with the representatives of local authorities in municipalities, of ministries of Serbia and the Republic of Srpska, but so far there have been no definite discussions on numerous open issues that socially disadvantaged families, but also the entire Serbian nation, are facing. www.serbsforserbs.org 2015 We hope that the current and any future authorities will have a better understanding and a willingness to engage in projects of our organization that aim to provide direct and concrete help to Serbian families and above all their children. Of course, I must emphasize the fact that, on March 5 of this year, we received the long sought humanitarian SMS number (7763) in Serbia, where we above all received support from the company Telekom Serbia, and Telenor and VIP as well. This kind of support from the state owned company Telekom Serbia but also the private ones like Telenor and VIP is commendable and appreciated, because precisely such form of donating will, in the future, enable us to help more families who desperately need help. Diaspora: This journal has supported your organization from the beginning. As your work is drawing the attention of the wider Serbian public, it can be noticed that the media with national frequencies in the Homeland are not turning their backs on you. Can this also be observed in the results of your work in the Homeland from the point of raising funds or is the number of families in need of social aid, that turn to your organization, increasing? Igor Rasula: Support of the Diaspora journal to our organization was more than significant, especially at the very beginning of our humanitarian work and action. As for the media in the Homeland, with national frequencies, things are changing in a positive direction, mainly thanks to the willingness and self-initiative of journalists to invite us as guests in their programs and to present already implemented and scheduled projects of the organization. We were the most present in the media during floods in May last year, when we organized and distributed great help to flooded families in the Republic of Srpska and Serbia, a value of over half a million euroâ&#x20AC;&#x2122;s. Our growing presence in the media certainly reflects on the increase in collected donations but also on a dramatic rise in the number of people and families turning to us for help. www.serbsforserbs.org 2015 Diaspora: In the past years, have you managed to establish cooperation with national humanitarian organizations in the countries in which your own organization operates? Igor Rasula: Certainly, in our charity work so far, we have made contact and cooperation with numerous related humanitarian organizations with whom we have together provided a very large help for Serbian people throughout the Balkans. We work actively with over 50 organizations in Serbia, Republic of Srpska, in Montenegro, FYR Macedonia and numerous Serbian communities and charities around the world. Results of such cooperation are tens of thousands underprivileged children who have been helped. Diaspora: By committing to provide financial support to Serbs in the Balkan countries, your organization has, in the nicest possible way, brought to life a verse of the poet Aleksa Santic: And wherever there is a Serbian soul / to me, that is where my Fatherland is. How do you choose the people you are helping? Igor Rasula: We come to a decision on which families to help in a variety of ways. Starting with information we get through the media, then contact with priests and monks of the Serbian Orthodox Church in the local eparchies, through recommendations of friends and donors of our organization, as well as direct requests we get from the families. We try to reach the most remote regions inhabited by Serbian children who need the help of our organization. Unfortunately, we fail to help all the people who turn to us for help and thatâ&#x20AC;&#x2122;s why we are often forced to refer the families to other organizations with which we also collaborate or to those organizations for which we know to provide the necessary assistance. We work and we will work hard in the future to increase even more our help to the Serbian people throughout the Balkans, in order to preserve the verses by Santic we brought to life. Diaspora: Youâ&#x20AC;&#x2122;ve mentioned the priests and monks of the Serbian Orthodox Church. How do you, otherwise, assess the collaboration with the Orthodox Church in general? Igor Rasula: The collaboration of our organization and the Serbian Orthodox Church is very active and concrete, especially in Kosovo and Metohija, Raska region, Montenegro and Krajina, specifically in the form of obtaining information about the families who need help, followed by supplying and distribution of necessary assistance. As I have mentioned, we maintain the collaboration with the priests and monks, because everyone in their own region and area has a better overview of the situation, the infrastructure, the organization of work and help for the endangered families. For example, in the Metohija region we have been collaborating most with the brotherhood of the monastery Visoki Decani, in Montenegro with the brotherhood of the monastery of Ostrog, in Krajina with the brotherhood of the monastery Ocestvo and Krka, and in the Raska region with the brotherhood of the monastery Djurdjevi Stupovi. Certainly, we have been receiving the necessary support and blessing from the relevant episcopes in a certain region which we are planning to help. Monthly Report for March In addition, we have been receiving a lot of help and support from the local priests of the Serbian Orthodox Church who are even more present within the people and have the information on whom exactly is the help necessary. Above all, our organization has been working with the blessings of the Serbian Patriarch Irinej since 2011.
www.serbsforserbs.org 2015 With the help of donors and friends around the world, we will try to expand and strengthen our organization even more so that we can tackle the numerous problems and temptations which thousands of socially disadvantaged multiple-child families, as well as the entire Serbian nation, are facing. Diaspora: Your organization, at the beginning, pointed to the low birth rate issue in Serbian national corps. Youâ&#x20AC;&#x2122;ve decided to financially help families with five and more children. Thereby, youâ&#x20AC;&#x2122;ve taken over part of the work that the State should have, not to say had to, devise and implement and thus bring to life. The impression is that this aspect of your help was left in the background. What is the reason for this, is it the increased number of Serbian families who are in need of social aid so the funds are not sufficient for all the needs, or is it the disappointment of activists of the organization who encounter lack of understanding of the authorities in the home country of Serbs as well as in other countries where Serbs live? Igor Rasula: The primary goal our organization, aimed to help, continues to be directed towards families with five or more children throughout the Serbian countries. As the organization grows and develops, thus we see a growing need to lower and correct criteria regarding the number of children, and again everything in order to help as many families whom the slightest help of our organization represents a huge unburdening from the everyday needs, expenses and costs which they have concerning children and the household. We are witnesses that numerous families we helped, after our actions of aid, got one or two children more in the family and thus proving that our help was really expedient and to the welfare of the family as well as the entire Serbian nation, who is, as you know, in danger of rapid extinction. www.serbsforserbs.org 2015 Beside the flood, the Elcic family from Batkovic had a fire in their family home. After the aid received from our organization, the house was completely reconstructed. During November, December and January, the Charity organization SERBS FOR SERBS delivered the third part of the valuable humanitarian aid to 26 families with children from Bijeljina and Sekovici, whose homes were damaged in the May floods in 2014, but also to one poor family with five children from Han Pijesak. As part of the FIGHT AGAINST FLOODS action, the families received aid in the form of repairing and upgrading houses, building greenhouses, providing sofas, bunk beds, kitchen cabinets, laminate, doors and windows, seeds, animal feed, appliances and other furniture in the total value of 30,079 BAM. The srdic family from Amajlije The Srdic family from Amajlije consists of five children and their single father, who supports them. They were provided with finances for the upgrade and completion of the upper story of the family house. Donors as well as members of the organization Serbs for Serbs from Canada took part in the aid action in the total value of 2,200 Euros. www.serbsforserbs.org 2015 Also, the organization helped a family who was not hit by the floods. It is the eight-member Lucic family from Han Pijesak, who received a donation in the form of a freezer and two bunk beds with mattresses. Members of the family are the parents, Vladimir and Bosiljka, and the children: Milovan (10), Miljan (8), Bojan (5), Goran (3), Bojana (2) and the youngest, Marko (1). The Mihajlovic family with donated goats and goat kids In the village of Rabovce, the Mihajlovic family was provided with goats with kids and a wood-burning stove. The parents, Bosko and Jelena, have two daughters: Andjela (10) and Maja (8). During February and March this year, the Charity organization SERBS FOR SERBS delivered aid to 18 socially disadvantaged families from Kosovo and Metohija. We had previously visited the families as part of the Christmas action and established the most useful way of helping them. As always, we owe big gratitude to our friends from EHO Majka devet Jugovica, whose cooperation enabled us to deliver the aid directly to the disadvantaged families. The value of the aid delivered was 1,200,000 RSD. The grateful Savic family from Kmetovac The Savic family from Kmetovac was provided with an electric stove, three-door wardrobe and bunk bed with mattresses. The family consists of the parents, Bojan and Ivana, and their two children: Isidora (7) and Mateja (6). In the village of Slatina, the Andrejevic family was provided with an electric stove and washing machine. The head of the household, Vlastimir, and his wife, Mirjana, have two children: Viktor (4) and Marija (2). The Dimic family with their new wood-burning stove We provided the young married couple, Boban and Nastrija Dimic, from the village of Mogila, with a wood-burning stove. When the weather conditions improve, there is a plan of constructing a bathroom for the Dimic family, which they do not have at the moment. The Banovic family was provided with firewood In Priluzje, the Banovic family was provided with firewood. The mother, Nadica, lives with her two sons: Strahinja (30), who is unemployed, and Batric (27), who suffers from schizophrenia. Tomislav and Marko Canic with their new electric stove and washing machine In the village of Ljustar, the Canic family was provided with an electric stove and washing machine. The family consists of the father, Tomislav, and his son Marko, who, being 20 years old, is the youngest resident of this village. In Priluzje, the Ilic family was provided with an electric stove, firewood, and clothes, food, hygiene products and diapers for the baby. The parents, Jovica and Marija, have a baby Bozidar, who is only two months old. The Markovic grandparents with their grandchildren, Sofija and Stefan, with their new wood-burning stove A wood-burning stove was delivered to the Krcmarevic family In the municipality of Vitina, Grncar village, a woodburning stove, refrigerator and two sofas were delivered to the Krcmarevic family. In Staro Gradcko, the Markovic family was provided with a wood-burning stove. In a dilapidated house hit by pieces of shrapnel live the parents Milan and Ljiljana with their children Sofija (4) and Stefan (2). Three older family members also live with them. In the following period, the plan is to help the family by fitting out the bathroom, installing laminate flooring and front door. The family consists of the mother and her three sons: Bojan (34), Srdjan (37) and Sasa (30). Bojan is married to Slavica and they have a son, Nikola (2). A wood-burning stove for the Miladinovic family Two sofas and a refrigerator were delivered to the Krcmarevic family The Maksic family from Gorazdevac was provided with a chest freezer. The family consists of the parents, Ivan and Sanja, and their children: Aleksandar (17) and Andrea (11). In Gornja Gusterica, the Miladinovic family was provided with a wood-burning stove, refrigerator and sofa. Goran and Sladjana have a son, Marko (23), who is married to Ana (25) and they have a one-year-old son Kristijan. www.serbsforserbs.org 2015 In a place called Grizime, the Miljkovic family was provided with two bunk beds with mattresses. The parents, Zoran and Mirjana, have ten children: Jelena (23), Marko (22), Milos (21), Milan (15), Milena (13), Aleksandra (11), Dejan (9), Jovica (8), Danijela (7) and Sara, the youngest (7 months old). www.serbsforserbs.org 2015 In the village of Klokot, the Spasic family was provided with a wood-burning stove, wardrobe and bunk bed with mattresses. The father, Jadran, lives with his wife Vasilija and they have two children: Sergej (2) and Anastasija (9 months old). The Savic family with the donated aid In the village of Prekovce, the Savic family was provided with an electric stove, refrigerator, sofa, table and chairs. Srecko and Ivana have two children: Novak (3) and Nikolina (2). In the village of Sumaci, the Stankovic family was provided with an electric stove and bunk bed with mattresses. The father, Sreten, lives with his wife Nena and their three children: Milos (14), Marina (12) and Mihajlo (3). The Stasic family from Velika Hoca was provided with a chainsaw. The parents, Strahinja and Brankica, have two children: Tamara (23) and Stefan (16). In the village of Dobrotin, the Trajkovic family was provided with a tractor tiller, refrigerator, sofa and wood-burning stove. Andrija and Djurdjevka have three sons: Nenad, Nebojsa and the oldest Vladica, who is married to Jelena. They have two sons: Nikola (7) and Bosko (3). We helped the Ivkovic family from the village of Straza by completely finishing the roof construction, together with windows, chimneys, and gutters and drainpipes. The family consists of the parents, Ivan and Mileva and their three sons: Lazar (24), Milos (22) and Bojan (19). This family tends to grow into a real small communal household, given the fact that two sons have recently started living with their wives in this household, Lazar with his wife Jelena, and Milos with his wife Aleksandra. Hence, we have decided to provide them with additional living space, by installing a roof construction on the second floor. www.serbsforserbs.org 2015 Kostadinovic family lives some 20 kilometers from Banja Luka where they moved from Montenegro. The father of the family worked there, but as it was getting harder and harder to find work, they came to the capital city of the Republic of Srpska as it was the closest city to their home town Novi Grad. In mid- March this year, members and friends of the Charity organization Serbs for Serbs helped the seven-member Kostadinovic family from Banja Luka. The family consists of the parents, Sladjana and Dusko and their children: Duska (16), Teodora (11), Stefan (7), Dario (5) and the youngest one, Sara (2). The Kostadinovic family was provided with a wood burning stove, washing machine, vacuum cleaner, 100 chicks, 4 piglets, feeders and poultry feed, as well as with a care package of food and hygiene products. On this occasion, the total value of the aid delivered was 3,914 BAM. The funds to help the family were provided at a charity event in F端rth (Germany) when 2,001.70 euros was raised and earmarked for the Kostadinovic family. Monthly Report for March Initially, they lived in Banja Luka as tenants, but as they didn’t have money to pay the rent and having been 5 days late with it, the landlord evicted them and their young children. That was when priest Srdjan came to help them and with thanks to the local community he managed to place them in an abandoned house. In that house, which at the beginning looked more like a ruin, the Kostadinovic family has been living for five years. Although the property doesn’t belong to them they were forced to repair it and rebuild it to create normal living conditions for the children. www.serbsforserbs.org 2015 The oldest one, Duska is 16 years old and she goes to secondary school in Banja Luka, Teodora who is 11, and Stefan who is 7 years old, attend elementary school, but like their older sister, they have to take a bus to school. The youngest, Dario (5) and Sara (2) stay home with their mum Sladjana. Having exhausted all possibilities to provide for children’s basic needs with her husband, in despair Sladjana gave an ad saying “I receive food as a gift” which spurred the good-hearted people to help the family. With 140BAM of monthly child benefit and winter, which prevented the father of the family to work for a daily wage, she no longer knew what to do next. After the heartbreaking news published on the internet about the difficult situation the Kostadinovic family was in, the Charity organization Serbs for Serbs in Germany organized the charity event, in Fürth, to help the family, when 2,001.70 euros was raised. A member of the Serbian Principality Association, who is our volunteer, was first to visit the young ones in the Kostadinovic family and was convinced of the fact that their parents are unable to provide even the most basic. The initial plan of assistance, agreed with the mother, Sladjana, was to help them with the insulation of the house, because all the heat went into the attic, to buy them a washing machine and to address the Electric Utility Company, Elektrokrajina, in written form with a request to write off part of the debt for electricity which currently amounted to 3,000 BAM. In the meantime, the company that repeatedly helped them in the construction and repairs of the house has taken upon themselves to insulate, for what they have already brought materials and equipment. In agreement with the parents we decided to buy them, apart from the aforementioned washing machine, a wood-burning stove, vacuum cleaner, food, chicks and piglets with necessary feed, which they will nurture and raise themselves and thus provide food for the children, in the long run. Thanks to them, our organization could redirect to other needs of small Kostadinovic. www.serbsforserbs.org 2015 All members of the Kostadinovic family are grateful to the donors from Germany who provided them with better living conditions in which they will be able to provide and thus earn a living for themselves. Poultry and swine feed with feeders delivered We set aside 600 BAM for the food. For chickens, pigs and their feed we spent 1,995.90 BAM, while for the rest of the money, 1,318 BAM, a washing machine, a woodburning stove and a vacuum cleaner were purchased. We call upon all people of good will to continue supporting the work of the Charity organization SERBS FOR SERBS and thus help and give joy to numerous children in need. At the end of March, members of the Charity organization Serbs for Serbs from the Republic of Srpska visited the six-member Jovanovic family from Trnova. Rajo, the father, and Snjezana, the mother, have four children: Danijela (9), Drazen (8), Danijel (6) and Vida (3). Talking to the mother, Snjezana, it was pointed out to us that her children are exposed to ridicule at school because their mother bathes them in a washing up bowl basin, because they wear other people’s clothes and don’t have nice notebooks and pencils like other children do. www.serbsforserbs.org 2015 The father, Rajo, is unemployed, but by working hard for a daily wage when someone calls him, he manages somehow to provide for his family. For a long time now he has been having backbone problems, and the pain has moved to his leg, leaving him unable to do any physically strenuous work, so his condition brought them to an even more difficult financial and social situation. They do not own any land, and Rajo’s brother has given them half of his house where they are living at the moment. They have at their disposal three rooms, a bathroom, and an entryway made from a closed veranda. They are currently accommodated in a 9m2 room, the only room which is heated, where all six of them stay day and night. Beds are worn out and in a state of decay. Other rooms are cold and lacking living conditions for a long-term stay. Soon after the first visit to the Jovanovic family, representatives of the Charity organization Serbs for Serbs delivered the first humanitarian aid package which primarily consisted of basic groceries (flour, oil, sugar, milk, fruit, vegetables and candy for the children), personal hygiene products and basic school supplies as well. On this occasion, the total value of the aid delivered was 582 BAM, but the plan is to purchase a water heater for the bathroom, so that the children can easily maintain personal hygiene, as well as footwear for the youngest members of the family. The Charity organization Serbs for Serbs calls upon all friends and donors of the organization from the Republic of Srpska to join our fundraising action to help this family and other socially disadvantaged Serbian families with multiple children. At the beginning of March this year, the Charity organization SERBS FOR SERBS delivered another shipment of humanitarian aid to 24 families with children from Doboj, whose homes were damaged during the May floods in 2014. As part of the FIGHT AGAINST FLOODS action, the families received aid in the form of refrigerators, washing machines, electric stoves, freezers and wardrobes in the total value of 12,418 BAM. The Charity organization Stara Raska and the Serbian Brothers Help of Canada also took part in the aid action for families in Doboj. Recently, representatives of the well-known Charity organization Serbs for Serbs visited the thirteenmember family consisting of 47-year-old Dragan and 37-year-old Dragana Ljubisavljevic and their eleven children and, on that occasion they delivered to the family care packages of food and other supplies in the value of 200 Swiss Franc – a donation purposed specifically to help this family. The family consists of Dragan, the father, and Dragana, the mother and their children: Milica (15), Andjela (14), Kristina (13), Lazar (12), Anastasija (11), Adrijana (10), Tamara (9), Natalija (6), Dijana (4), Milan (2) and the tenmonth-old baby Martina. The arrival of a fully loaded jeep in front of the house of the Ljubisavljevic family caused the children to scream and bounce joyfully up and down because the benefactors started unloading food and what they like the most – sweets and chocolate creams. There was flour, oil, salt, sugar, milk, different types of canned goods and other groceries, in addition to the one thing which, naturally, made mother Dragana the happiest – several packages of laundry detergent. Purchase of food and hygiene products On behalf of the organization, Novica Cvetkovic who is a member and also the organization’s representative for the Pcinj county, went to visit the family and didn’t hide his pleasure at having met this multiple children family which has been bravely struggling to survive in these difficult times. Monthly Report for March Thanks to the writing of Frankfurt’s “Vesti” we found out about this mutilple children and hardworking family which struggles daily to provide and survive on their hearthstone, in the village of Stropsko, 4 kilometers away from Vranje. We have witnessed a great sacrifice of mother Dragana who, all day long, takes care of the children very close in age. The oldest one is 15, and the youngest is only a year and a half old. Also, the concern of Dragan, the father, is nothing less; he is almost never at home, he is constantly somewhere in the village, working for a day wage. He leaves early in the morning, and comes home late at night. We would like to thank the “Vesti” for allowing us to find out about the xistence of such Serbian families because they deserve our attention and care. Finally, these children are the future of our Serbia – says Novica Cvetkovic. www.serbsforserbs.org 2015 We couldn’t afford to get them such things even for the greatest Orthodox holidays. May God give long life to all our benefactors and the Charity organization Serbs for Serbs which is wellknown for helping the poor and poor families with many children? May God bless them all and give them health and happiness- says Dragana. The Ljubisavljevic families, who live in a peaceful village by the river, have their own little greenhouse. In the morning, after she takes care of the youngest children, Dragana and her adult daughters leave to finish off work in the greenhouse, to carefully plant any seeding and then she hoes, weeds and takes care of future stems of tomatoes and peppers. This year started beautifully for us, thanks to various noble people from abroad and Serbia for who found out about us by reading the “Vesti”. Even though we struggle to survive every day, the help we receive makes our lives a lot easier. There is always hot home-made bread on the table, and now, in addition to the bread there are other groceries that have always been a real luxury to us and our children. This greenhouse means the world to us because it provides vegetables which later on make it easier for us to sustain and survive. Often, children don’t even wait for tomatoes and peppers to ripen, and they eat them while still half ripe. We don’t have quality soil yet, and we might plant and produce potatoes, beans, cabbage which would suffice for our needs at least – says Dragana who doesn’t condone their destiny. www.serbsforserbs.org 2015 Why hide it, we are happy, life is only one and unique. Some spend their lives complaining, and we try to laugh as much as we can and enjoy each other, because God gave us both, the children and the health. Is it too little??! â&#x20AC;&#x201C; says the mother, Dragana Ljubisavljevic. Going away, for the umpteenth time, we come to a conclusion that, despite their everyday life difficulties, the Ljubisavljevic family is one happy family with a home full of love, where you can constantly hear songs coming from the transistor or TV which they also received from good people. In March, the Charity organization Serbs for Serbs from the Republic of Srpska helped eight multiple children families from Zvornik, which are members of the Association of parents with four or more children ‘’Nasi andjeli’’ from Zvornik. None of the parents is employed, and they all live on wages and depend on subsistence agriculture. The families were provided with food and hygiene products packages. On this occasion the toatal value of the aid delivered was 702 BAM. 1. Maksimovic Milana, unemployed single mother of four: Marina (13), Kristina (10), Sandra (7) and Zorana (5). Monthly Report for March 2. Peric Nenad and Sladjana, unemployed parents of four: Marko (13), Darko (12), Mihajlo (5) and Milica (4). They are in a very difficult situation because of Nenad’s illness and they are struggling to survive. 3. Milic Mile and Gordana, unemployed parents of four: Valentina (18), Jovana (15), Brankica (11) and Dusan (2). 4. Mijic Cvijan and Sladjana, unemployed parents of four: Filip (6), Marija (5), Aleksandar (2) and Kristina (1). www.serbsforserbs.org 2015 They live on Dragan’s day wage in extremely harsh conditions. They live in the house of Dragan’s father, in the basement. Mijic family 5. Kostic Jovan and Suzana, unemployed parents of four underage children: Andjela (8), Ivan (7), Jana (6) and Vidan (4). Because of his illness, Jovan is unable to work and provide better life for his children. 6. Todorovic Dragan and Snezana, unemployed parents of four: Dragana (11), Svijetlana (9), Tamara (5) and Bosko (2). Spasojevic family 7. Draskovic Miodrag and Biljana, parents of five: Aleksandra (14), Dejana (13), Jovan (11), Milan (10) and Goran (6). No one in the family works and they all live on the wage which Milan earns. 8. Spasojevic Mile and Gordana, unemployed parents of four: Savo (18), Sanja (14), Luka (10) and Predrag (8). On behalf of the families, members of the Association ‘’Nasi andjeli’’, we take this opportunity to thank the Charity organization Serbs for Serbs for the help. On March 29, this year, the Charity organization SERBS FOR SERBS delivered humanitarian aid to families with children that were hit by the floods in Petrovac na Mlavi. This time, as part of the FIGHT AGAINST FLOODS project, 7 families received aid in the form of 3 freezers, 2 electric stoves, 1 refrigerator and 1 washing machine. The total value of the aid was 200,423 RSD. The funds for this action were provided by the parishioners of The Most Holy Theotokos Church from California in the USA, who sent donations in the amount of 2,942 American dollars. We thank the municipality representatives, who helped us, visit the families and deliver aid. All appliances are of the Gorenje brand, with five-year warranty, and they were delivered thanks to our friends from Tehnomanija. The big FIGHT AGAINST FLOODS action continues. The Charity organization Serbs for Serbs calls upon all fraternal organizations, donors and people of good will in Serbia and worldwide to get involved in the action by donating money into one of the accounts of the organization â&#x20AC;&#x201C; www.srbizasrbe.org/donacije. At the end of March, the Charity organization SERBS FOR SERBS helped the multi-member Lukic family from Velika Hoca in Kosovo and Metohija. We had visited the family at the end of last year and on that occasion we had agreed on helping the family by purchasing them a tractor for cultivating land. The Lukic family counts 11 members, the oldest ones being Miroslav and Jasminka; their son Dalibor is married to Milica and they have two children: Tomislav (7) and Veljko (2); their son Mladen is married to Jelena and they have two children: Radmila (6) and Teodora (3); their youngest son is Ratko (26). The total value of the tractor is 4,500 Euros. A great deal of help with the purchase and direct delivery was provided by our friends from the Visoki Decani Monastery. Grandma Jasminka with her grandchildren Teodora, Veljko, Tomislav and Radmila The Lukic family members live in a small communal household on welfare and child benefit, but they are hardworking and diligent in cultivating 1.2 ha of land, so the aid in the form of the tractor will make their work in agriculture a lot easier. The Chicago members of Serbs for Serbs held another small Palacinka Party to start the year off. Our goal was to introduce new friends to our Charity Organization and to start planning for this year's 3rd Annual Trojka Iz Bloka here in Chicago. The Palacinka Party was a success in that we were able to raise $750 in donations and select a date and location for this year's charity 3-point shooting tournament. With June coming up quickly, we needed to make sure all of the preparations will be well under way. Even though work and family schedules are keeping everyone busy and the frigid temperatures are keeping everyone indoors, a few good souls where able to get together this past weekend. www.serbsforserbs.org 2015 And already, we have started calling contacts to see who can get Nikola Mirotic of the Chicago Bulls to join us this year. The Zuric sisters On Saturday, March 21, this year, the Organization of Serbian Students in Switzerland organized the second annual Charity Easter concert. This year the concert was held at a ceremonial room of the Serbian Orthodox Church in Schwamendingen in the Canton of Zurich. The charity concert featured the church choir, the Cultural artistic society Izvor, the ethno group Zuric sisters and the guitarist Luka Stamenkovic with his colleagues: singer Andrea Fischer, saxophone player Fabian Zarisch and guitarist Aliage Zwirn from the Academy of Music in Zurich. The concert combined traditional and newly interpreted ethno music of the Balkans. About 40 people attending were delighted by the program presented, and expressed a wish of a similar event being organized again soon. The amount of 1,300 Swiss francs was raised at the show, and all the money raised is designated for the seven-member Simic family from Kostajnica near Doboj in the Republic of Srpska. NEVER FORGET MARCH 24, 1999! The NATO bombing of the Federal Republic of Yugoslavia, which is also known as the Merciful Angel in Serbia, lasted from March 24 to June 10, 1999. It was the second bombing of the NATO aggressor, after the attack on the Republic of Srpska in 1995. In the air attacks which lasted continually for 78 days, infrastructure, industrial facilities, schools, healthcare centers, media headquarters, cultural monuments, churches and monasteries were badly damaged. According to various estimates, the total amount of direct material damage ranges from $30 billion to $100 billion. It is estimated that 2,500 people were killed and about 5,000 were wounded, the casualties being civilians as well as soldiers and police officers. Serbs for Serbs Report March 2015.